Halloween costumes are one of those things that I can’t make myself do. I love the idea of Halloween costumes. I love how other people look in Halloween costumes. I think I’d even love how I looked dressed up like Amelia Earhart or Maleficent . . . if it were a matter of just snapping my fingers. It’s the effort though. I just can’t. It’s like those people who gift wrap presents with the fancy paper, creases along each edge, and some sort of dangly ornament tied onto the big, handmade bow. It’s so special looking. I want to be those people. It feels awesome to get those presents! The thoughtfulness just oozes from every carefully placed piece of tape. And then there’s me. Have you ever seen those flimsy cardboard boxes that are printed to look kind of like wrapping paper? You probably wondered if anyone even buys them. Maybe people just buy them to put under their beautiful real wrapping paper as an extra festive layer? Could there possibly be a market for them otherwise? It’s me. I’m the market. Maybe the whole market. Throw a gift in there, tape it shut (optional), and then stick a plastic sticker-bow on top. DONE. I don’t know how you people do anything else. I can barely do the laundry over here. This is often my issue with throwing parties, too. Not only do I have to clean my apartment, but then I’m supposed to make it look cute and make food and entertain people, too? I love when it all comes together, but I feel so overwhelmed at the outset. That’s why I created these incredibly easy Maple Cream Snickerdoodle Bars for “Progressive Eats,” a group that creates a monthly, virtual progressive dinner. I’ve never been to a real progressive dinner, but they sound like so much fun. You head to a different person’s house (or blog, in our case) for each course of a meal. The Progressive Eats host this month, Barb, chose a Cocktail Party theme and charged me with making a perfect handheld dessert. These bars fit that bill and are also quick to prepare (and so addictive). 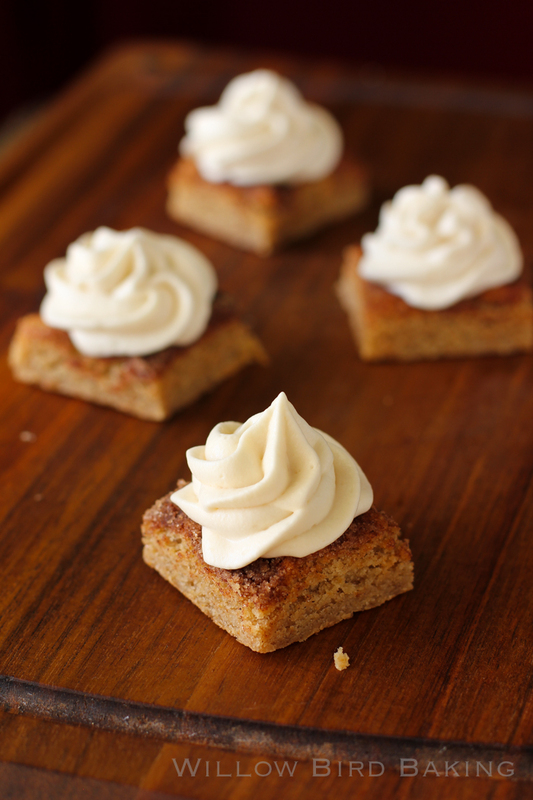 There may not be any Maleficent costume this year, but you won’t care after a snickerdoodle bar or two. I promise. Ready to see the rest of the Cocktail Party recipes? Have you ever participated in a progressive dinner? These snickerdoodle bars pack a ton of autumn flavor in a tiny package. They’re quick and easy to prepare and perfect as a party finger food. You might want to double the recipe for a crowd, and make it in a 9 x 13-inch pan. Make the snickerdoodle bars: Preheat the oven to 350 degrees F. Grease an 8-inch square baking pan and create a foil sling: tear off 4, 16-inch long pieces of aluminum foil and fold them in half. Situate two side-by-side in the pan, covering the bottom of the pan to the edge (they will overlap). Situate the other two strips in the same manner, but perpendicular to the first. 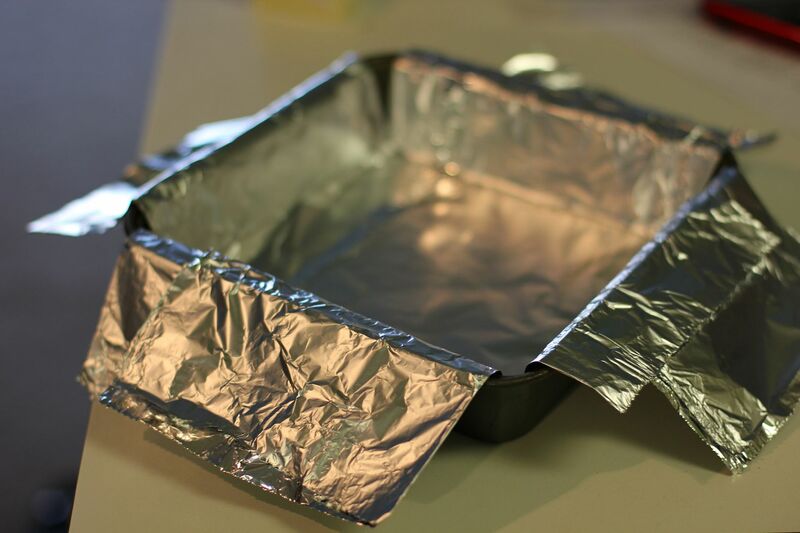 The overhanging foil of the sling will make it easy to remove the bars from the pan after baking and cooling. Grease the foil as well. In a medium bowl, whisk together flour, baking powder, 1/2 teaspoon cinnamon, and salt. In a separate large bowl, cream together the butter and brown sugar. Add the eggs and vanilla and mix to combine. Add in the dry ingredients and mix to combine. Pour the batter into the prepared baking pan. In a small bowl, mix together the 2 tablespoons white sugar and 2 teaspoons cinnamon. Sprinkle this topping over the top of the batter. Bake for 25-30 minutes or until the top of the snickerdoodle bars springs back when touched. Let these cool completely before removing them using the foil sling to a cutting board and cutting into 12 small bars. Make the maple cream: Place 2 tablespoons of water in a small bowl. Sprinkle the gelatin evenly over the water and let it stand for 10 minutes to soften. In the meantime in a chilled mixing bowl, mix whipping cream and maple syrup on low speed. Microwave the gelatin for 15 seconds or so and then whisk to dissolve. Turn the mixer up to medium speed and add the gelatin and maple extract while continuing to stir. Continue beating the cream to stiff peaks. Chill the maple cream until it sets up a bit before mixing it gently to loosen, putting it into a pastry bag, and piping onto cooled snickerdoodle bars. Beautiful bars, very nicely done! haha, I’m not creative with costumes or wrapping paper either. I can definitely do bars like this though! So yummy. Never heard about progressive dinner before, but it does sound fun! I wouldn’t mind having all these bars for myself though… They look so cute and yummy! I also am a non costume person. I will put a witch’s hat on- every year- and that is it. I do love wrapping gifts through. Mine may not be perfect but I love the process. And I get so mad at manufacturers who create odd shaped boxes and packages. They are a nightmare to wrap nicely. it should be a requirement that everything be in a square or rectangular box shape! You may not be a gift wrapper- but your treats… to die for. I bet anybody would trade their gifts in heartbeat for these bars!!! Yum! That maple cream sounds so good – great idea adding gelatin to it to hold it up! These are GORGEOUS! Absolutely perfect for a party. I’d forgotten about that tip of adding gelatin to hold whipped cream in shape – great reminder for that. It totally works. And yes, I often feel a bit overwhelmed by all the party preparations before the first guest has even arrived!! Really, thanks for participating with our party this month; now let’s all have a cocktail. Cheers Julie! These look so good, Julie! 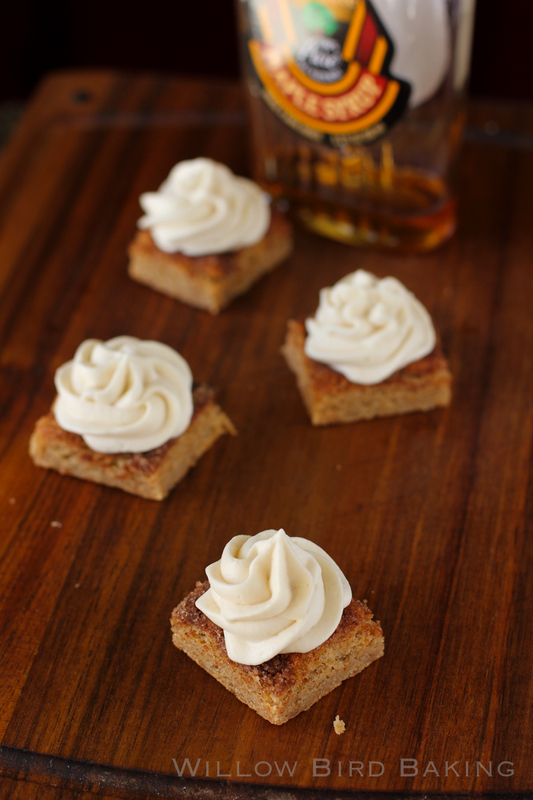 I’ve got a bit of a maple obsession going on these days, so these are right up my dessert alley! oh my god. I love absolutely everything about these. Snickerdoodles are my favorite but topped with maple cream?! Perfection! Julie these bars are a beautiful little present, all wrapped up with the perfect maple cream bow! I would love to snitch a few while no one is looking, LOL. 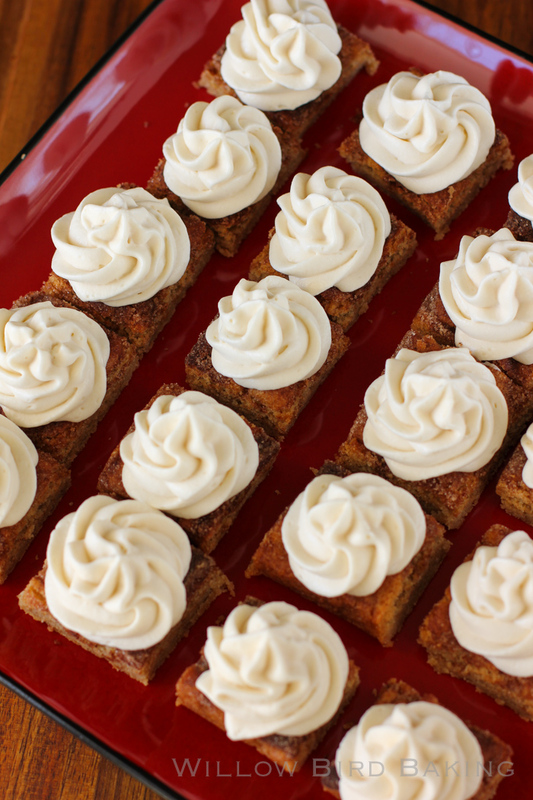 These treats are wonderful and would be perfect for any special occasion and holiday parties! 🙂 Thanks for backing me up this month, I really appreciate it! Oh man, I totally hear you on the costume thing, Julie! It’s why I’m totally boring and am pretty much either Medusa (dollar store snakes bobby pinned to my hair) or a spider every year 🙂 And also, you sure know how to slay me on the dessert front because these babies need to be in my life ASAP!